To keep our supply chain as sustainable as possible, we make sure our suppliers take social and environmental standards seriously. By sourcing locally when we can and screening all of our suppliers, we minimize environmental impacts and ensure there’s no unfair or unsafe labor that goes into making our swimwear. We prioritize raw materials with recycled-content and opt for solutions that are recyclable or biodegradable where possible. Which is why we chose a revolutionary swimwear fabric that is produced to the highest standards in Italy. An Eco-friendly fabric made with 78% ECONYL® Fibre, a 100% post consumer waste Polyamide yarn and 22% Lycra xtra life. 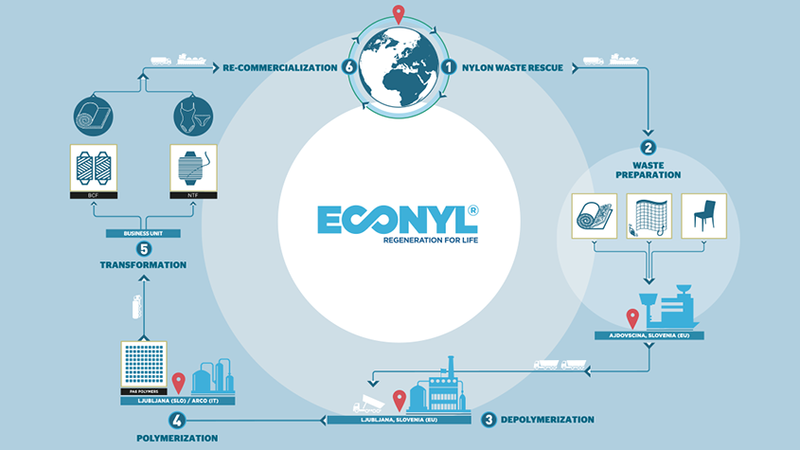 ECONYL® has developed a regeneration system that has been created through an innovative and sustainable way. The yarn is made from regenerated Nylon 6 waste that is collected all over the world and sent to the ECONYL® waste treatment center in Slovenia. The original waste consists of pre and post consumer waste, from fishnets, nylon scraps and carpet fluff. The cleaned nylon waste is shredded, compacted, bagged and transported to The ECONYL® Depolymerization Plant, where it goes through a radically new purification process. It then goes through the ECONYL® Polymerization Plant, where Polymerization transforms the regenerated raw material into Nylon 6 polymers. The Nylon 6 Polymers are then transformed into textile yarn. The ECONYL® yarn can be regenerated over and over for an infinite number of times without any loss in quality. LYCRA® XTRA LIFE™ fibre prevents deterioration in our fabric and gives the swimwear excellent shape retention and fit, even after numerous wears. Because of this. the garment has an extended life compared to most swimwear using elastane. LYCRA® XTRA LIFE™ fibre also aids in the fabrics resistance to chlorine and sunscreen.